When the Lily project imploded in 2017, it was huge news that went well beyond the usual drone industry circles: $34m worth of pre-orders, 60,000 backers left with nothing but the vague promise of a refund; many of whom were left scarred from their first foray into the exciting world of consumer drones. After the dust settled and the original startup was wound down, the vultures – also known as opportunistic competitors – began to circle. Viatek won the auction for the patents, hardware and Lily drone technology, stating at the time that many of the models were in full working order and that it was a matter of months before the promised drone would be released. Then came the Mota Group, which hoovered up all of the original Lily project’s branding rights – including the website and contact information of its 60,000 backers. The company promised to deliver a drone that, although not what original backers had put their money toward, was as close as they were going to get. So how have things gone since then? Well, Viatek is yet to release its rebranded Lily drone, so we can’t critique that. But the Mota Group was pretty quick to bring to market a drone complemented by all the branding of the original project. So Lily came back to life. The bad news was that Mota’s version of the Lily drone didn’t have the waterproofing and hand-launch capability that helped make the original so appealing. Which was fine. The company didn’t lie about the new drone’s capabilities or mislead customers as to what it could do. There is, however, a grey area over whether or not original Lily backers were handled in the most appropriate manner. As well as the branding rights, the Mota Group purchased the huge list of initial backers; all possible leads, but essentially a catalogue of screwed over investors, disappointed dreamers and drone newbies. As you’d expect, they were contacted – some directly by phone – offered a discount on the retail price of the upcoming drone, and even share options ahead of the company’s purported IPO if they made a purchase. The new drone did hit the market and get out to customers. But the San Jose company has since been found to have overstated its revenue for 2016, agreed a settlement with the U.S. Securities and Exchange Commission, and withdrawn its IPO registration statement. Cynical, opportunist, savvy, exploitative, genius, great business… we’re not sure what to make of these methods to be honest. We don’t know how many of the original project’s backers went on to purchase Lily Next-Gen from Mota. But given that original backers were offered a significant discount and an investment opportunity, it’s likely to have been a substantial number. We just hope that the Mota Group hasn’t picked up where the original project left off, by disappointing customers in the long run. This article was bourne out of an email DroneLife received from one unhappy Mota Group customer. Like many we spoke with, she was an original backer of the Lily project and convinced by the Mota Group to put her refund toward the new Lily drone. That was in December 2017. She still hasn’t received her Lily drone. This delay would appear to be an exception to the rule. As far as we know, the Mota Group has fulfilled most of its orders, while a few have somehow been allowed to slip through the cracks. But we didn’t have to look too far to find other dissatisfied buyers. After a quick message to a Facebook group dedicated to Lily Next-Gen buyers, several unhappy customers proceeded to send their stories through. Some had given up on ever receiving their order and accepted a refund, others are still waiting for a refund weeks after asking for one; some had ordered in July and are still waiting, one had ordered in August and is still waiting. Several had been told that a typhoon in Asia was the reason for the holdup for orders in the past couple of months, and had tens of emails unanswered by the company. The one thing all seem to have in common is a lack of adequate support from the Mota Group: multiple ignored support tickets, no response from the website’s customer service agents and, when a reply has been forthcoming, it hasn’t been helpful at all. A number of the people who contacted us have received emails saying their support query had been closed, despite the fact that it hadn’t been resolved. All of this is not good, of course. But again we can’t say how indicative it is of the Mota Group’s wider customer service. We got in touch with the Mota Group to see if there was any reason for these delays and how prevalent this kind of situation is. The company’s director of communications, Kirwan McHarry said, “No customer should have a delay like this. 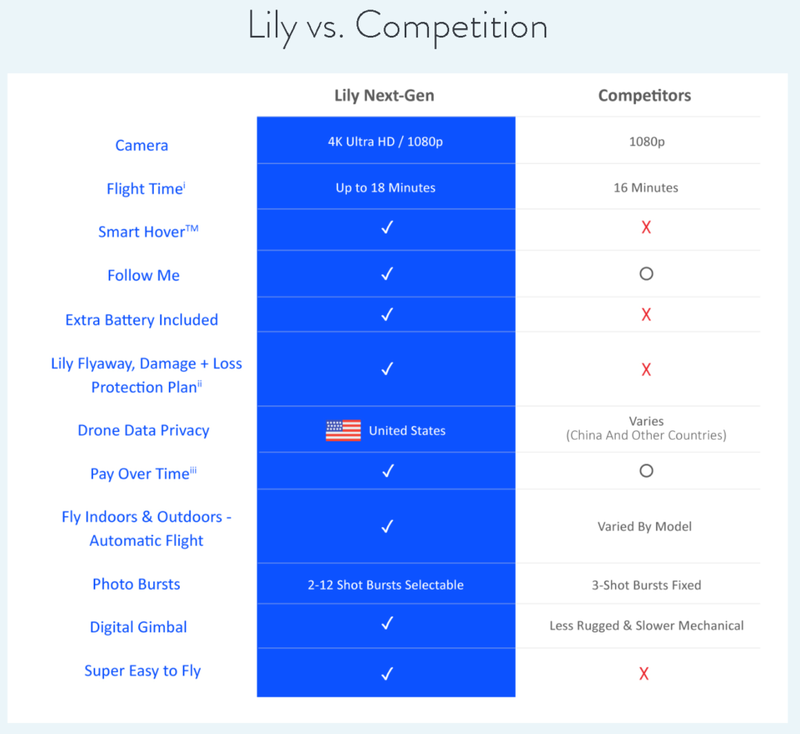 We know some had pre-ordered the Lily camera drone from Lily Robotics and some of those lost their deposit. It’s an extra reason why we need to be exceptionally good at ensuring customers get their orders fulfilled on a timely basis. “That said, we have had tremendous demand and with it some growing pains,” she said. McHarry promised to resolve the customers’ issues that had been drawn to her attention and said the company would look at the complaints against its service, before starting a discussion internally to create a feedback system where issues can be escalated through to headquarters more easily. 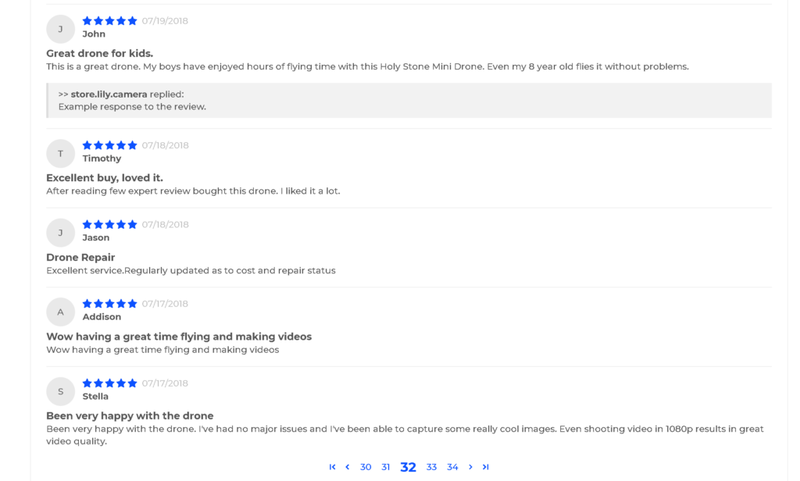 While looking into the Lily Next-Gen’s new website and the way that customers can interact with live chat support staff, we came across a page full of very enthusiastic reviews for the new drone. Over 300 in fact. All except one (yes, one) were 4 or 5 out of a possible 5. That struck us as a little suspicious, so we delved into the reviews to see how genuine they were. One page we found particularly funny was full of 5* reviews from Nick, all left on the same day last week. We suggested to Mota that perhaps the reviews weren’t genuine, and implied that they were being written en-masse by what seems to be authors whose first language isn’t English. 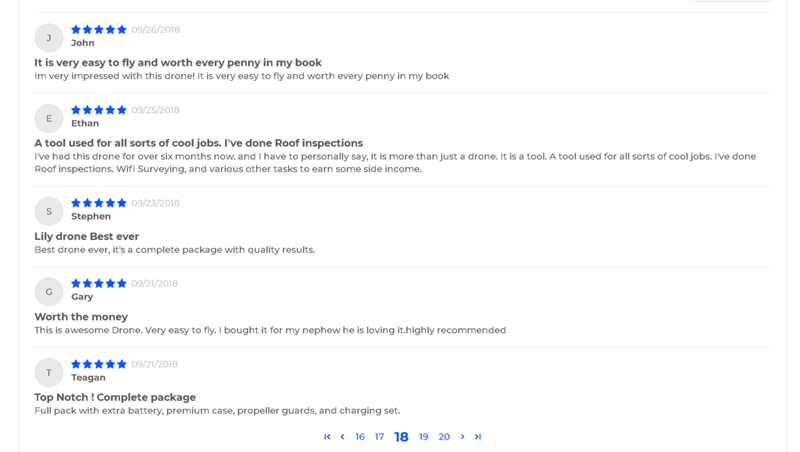 Of course, Mota has customers all around the world and reviewers may be writing in English. But this fishy to say the least. No customer base can be this positive, surely? The Lily website also offers regular popups showing new orders and where they were made. It would be interesting to see how legitimate that feature is. We fear it’s just another, more subtle selling tactic. “The customer comments and pop-ups are an automated feed to our site by a third-party company from our order system. The screenshot you sent of Nick may have been one comment that was pulled out into 5 separate ones. We’re checking with the vendor to find out what happened and prevent it,” said McHarry. It looks as though whoever is responsible for organizing the Lily Next-Gen drone reviews on behalf of the Mota Group is misleading at best. Enthusiastic Nick above is suspicious. But there’s more. Take a look at Andrew below. He likes using his Lily Next-Gen for roof inspections. Nice. Oh wait. So does Ethan, also below. And, funnily enough, he describes his experience with exactly the same review, word for word. Even the title is the same. That these two identical reviews are exactly one month apart makes this Lily Next-Gen review A.) obviously fake or B.) a very strange coincidence, in which Andrew panicked while leaving his review and had no choice but to copy Ethan’s from a month earlier. Things get weirder still with John’s review, below. He’s not even talking about the Lily Next-Gen. He’s just leaving 5 stars because he loves another company’s drone. Jason below is also reviewing something completely different, a drone repair service? What is going on here? It’s all just a shame really, isn’t it? It’s a shame that a company – knowingly or not – has to resort to these kinds of measures to sell a drone. Since we started asking questions, the review section seems to have been taken down from the Lily website. We guess that’s a positive step. There are blurry ethical lines in marketing. You can be misleading without lying. You can easily fool new customers into making uninformed purchasing decisions with a few choice phrases. We’re not going to go through that table line by line. But let’s get this straight: The Lily Next-Gen is selling for $699. This is not a toy. When you are selling a product for that much money you need to be straight with your customers. Sure, point out all the wonderful things your drone can do, but don’t pretend that it’s setting the industry standard when it isn’t. 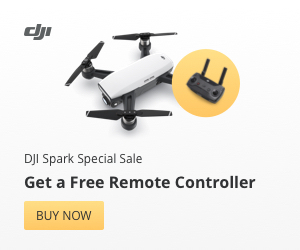 We call BS on at least 50% of the rows in the table above, particularly considering that you can buy a DJI Spark for cheaper. All of this might sound like we’re being unnecessarily harsh on the Mota Group. Plenty of online retailers use underhand tactics to boost sales. Fake reviews and bold, misleading product descriptions are rife across the web. Customers have to take responsibility and do their homework. But it’s worth bearing in mind that the Mota Group, more than most, have a particular responsibility to be honest and straightforward with their customers. After all, the Mota Group is benefiting from the name, branding and contact list of the consumer drone industry’s single biggest let down to date. 60,000 excited pre-orderers were left disappointed by the original Lily project. Many still haven’t been refunded and probably never will be. So really there’s no excuse for fake reviews, misleading marketing materials and – from what we’ve heard – customer service that could do with an upgrade. It goes without saying that unjustified hype, over-promising, and saying and doing whatever it takes to secure sales are not the ways to win friends and business among drone enthusiasts.